AGUA DULCE, CALIF. – Staying true to its core value of promoting “The Happiest Race on Earth,” NORRA today announced a new three-way partnership with MAG 7, Amber Racing Service and F&L fuel to provide racers with world-class support services at the upcoming Yokohama NORRA Mexican 1000. The new agreement offers several tiers of service down the remote Baja peninsula for the upcoming event, a 1,256-mile journey from Ensenada, Baja, Mexico to the shores of San Jose del Cabo. The 10th running of the retro-themed rally is expected to attract more than 250 entries in a variety of classes for a five-day adventure that runs from April 26th to May 3rd. For all NORRA classes, in 2019 the basic Mexican 1000 MAG 7 “Emergency Package” is FREE to each and every competitor. MAG 7 pits are stocked with water, food, oils, lubes, power tools, air tools, generators, C02, jacks, lights as well as Weatherman and radio communications. 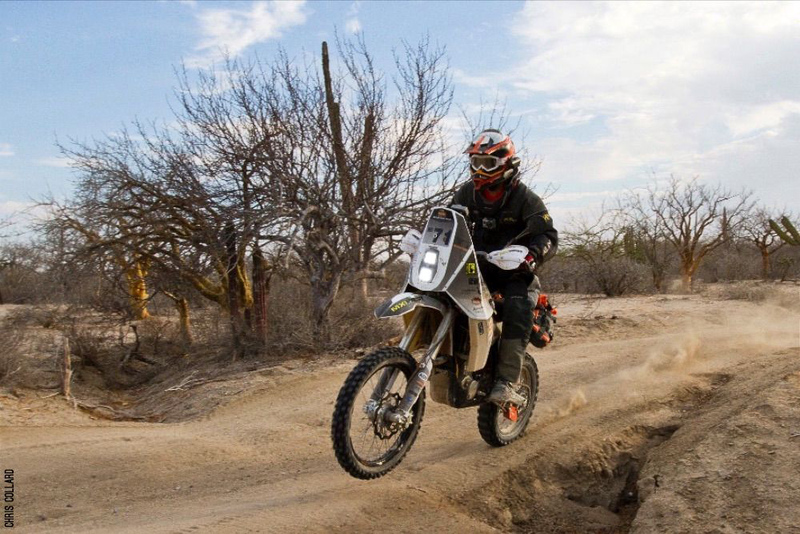 MAG 7 will provide all racers with anything they may need to help get you down the Baja peninsula. There is no sign-up needed for this, all racers can simply pull into any well-marked MAG 7 pit location and get the assistance they need. MAG 7 / F&L FUELS SIGN-UP. CLICK HERE! Thanks to a new joint program with Amber Racing Services, high-quality F&L race fuel will now be available to all NORRA racers. For those wishing to run their pits via MAG 7’s legendary “Full Service Package,” the pitting organization will haul race F&L race fuel as well as a team’s spare tires, spare parts and provided supplies to each MAG 7 pit a racer wishes to designate. MAG 7 can fuel racers with moto dry brakes and 11-gallon dump cans. 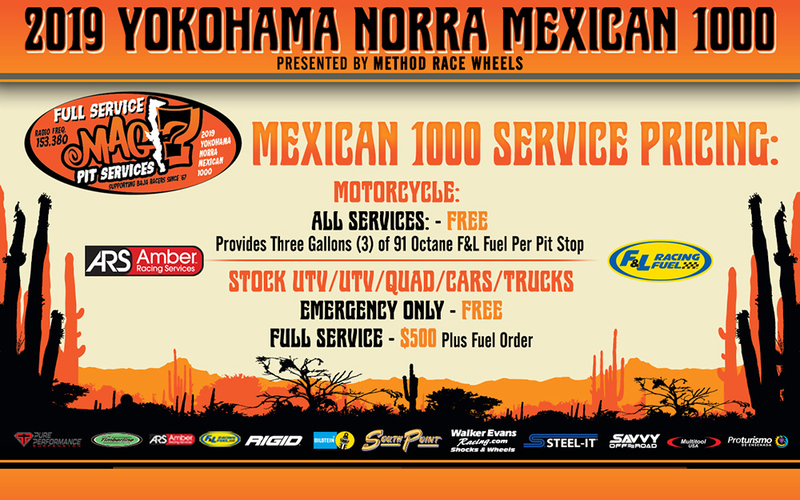 Speaking of motorcycles, all NORRA Mexican 1000 bike teams will enjoy free pitting and fuel services that offers three gallons of complimentary F&L fuel at each stop. NORRA MELTING POT: One of the most unique elements to the Yokohama NORRA Mexican 1000 is the wide variety of race vehicles involved in the event. From high-end, dual-sport motorcycles (top) to production-based UTVs, the retro-style rally has something for everyone. The cost of the “Full Service Package is just $500.00 plus the cost of the F&L fuel, a fantastic value at just $100.00 per race day considering MAG 7’s crew must cover almost 1300 miles for five full days with one full service pit each day (two pits for Day 3 on the four-wheel vehicles). All MAG 7 staffing and travel is done on an all-volunteer basis helping on their personal vacation time. 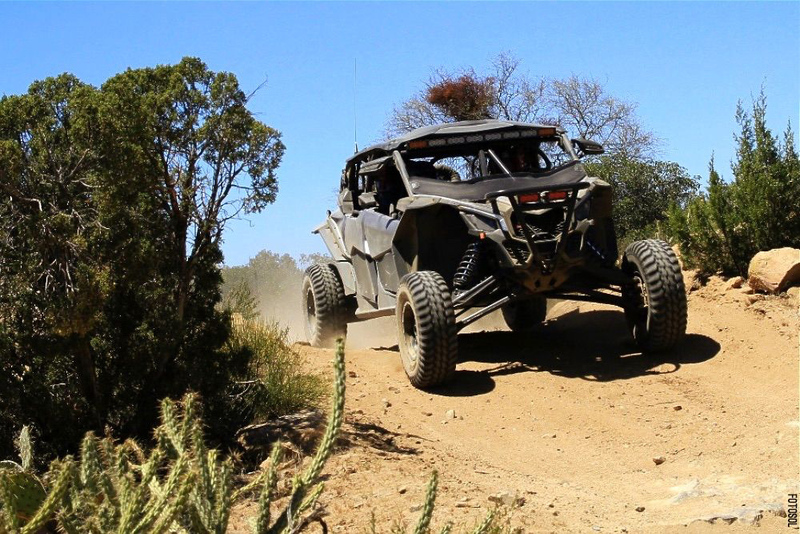 The challenges of racing in NORRA’s growing category of stock UTVs has also been addressed, with the “Full Service Package” offers the option of much-needed fueling option support every 80 miles (in addition to road crossing and Pemex stations). This service is a huge aid to Baja stock UTV racers as they must run stock fuel tanks, which offer a very limited fuel range. 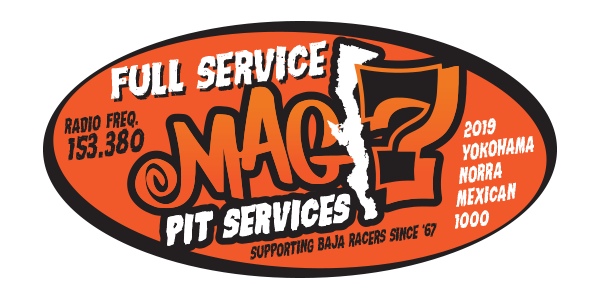 MAG 7 is an all-volunteer, non-profit organization whose mission has focused on supporting Baja racers since the first Mexican off-road race in 1967. This is what they love to do! To sign-up for all MAG 7 Full Service Packages, racers are encouraged to register online at www.mag7race.com. Note: online registration closes on Sunday, April 21, 2019. Beginning in 2010, the National Off Road Racing Association (NORRA) began promoting a rebirth of the NORRA Mexican 1000 rally. The unique off-road rally was co-created by promoter Mike Pearlman to consist of special stages (unlimited speed timed stages in the dirt) linked together by controlled speed liaison / transit sections (highway). 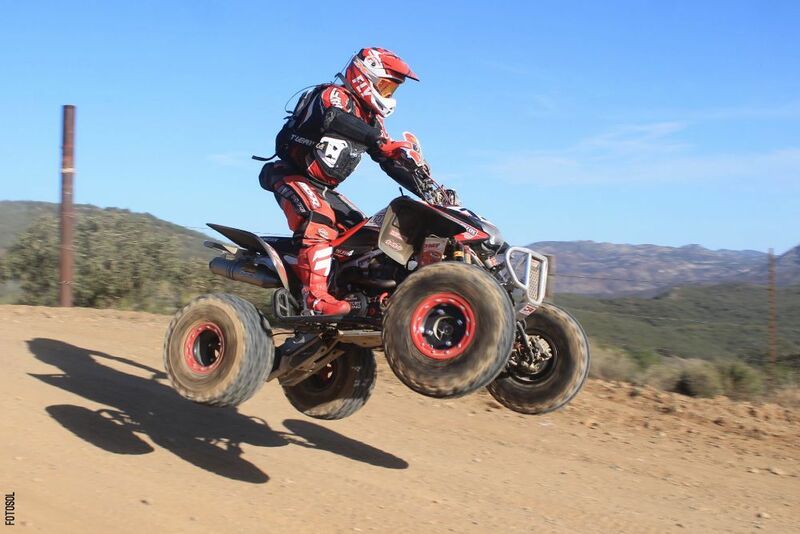 The one-of-a-kind, once-a-year, five-day rally includes vintage off-road vehicles and motorcycles, as well as modern desert Rally Raid cars, pre-runner trucks, buggies, UTVs and motorcycles. Pearlman’s late father Ed and others established the first running of the NORRA Mexican 1000 off-road rally in November of 1967, which eventually became internationally recognized and evolved into the Baja 1000 in the mid-1970's. 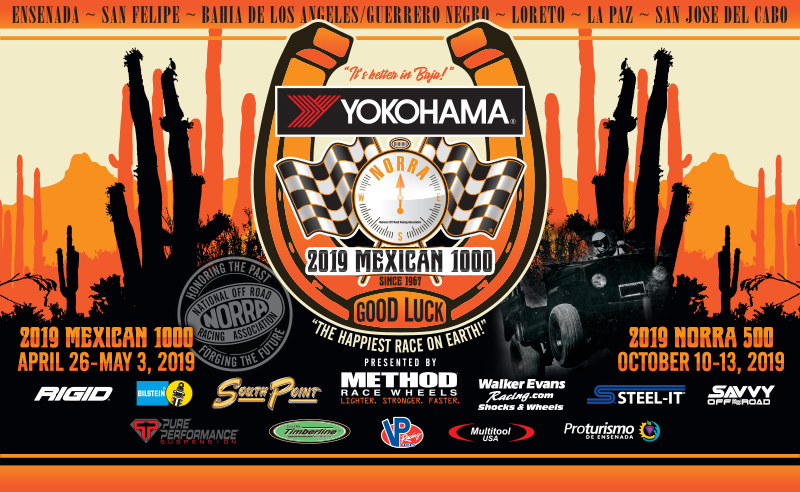 The 2019 YOKOHAMA NORRA Mexican 1000 is supported by Yokohama, Method Race Wheels, South Point Hotel Casino, Walker Evans Racing, Bilstein Shock Absorbers, Pure Performance, Steel-It, Multitool USA, RIGID, Savvy Offroad, F&L Racing Fuels, Timberline, Ensenada Proturismo, Cerveceria Transpeninsular, Biltwell Inc., Schampa, Racing TraX.com, Satellite Phone Store.com, P.C.I. Race Radios, WARN, Magic Bullet, US Action Trax.com, and many more.